In this Part, we will explore the meaning of the Eighteenth Shloka of Sri Vishnu Sahasranamam. Bhagavan is the One who is to be realised and He is easily attained through Bhakti. He is the all Knower and possesses complete knowledge of all branches as He created the Universe. 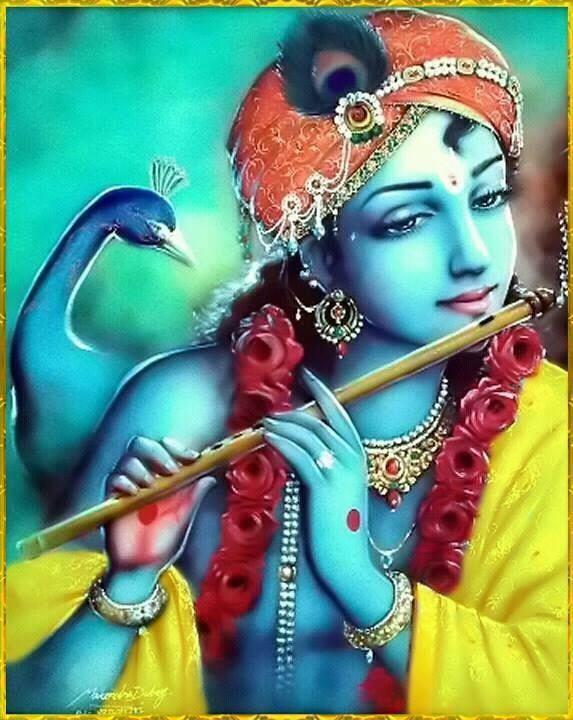 He is forever in meditation and forever available to his devotees. He is the slayer of the wicked and a propounder of knowledge of the Supreme Being. He is like nectar to his devotees and one who cannot be sensed by the sense organs as he is beyond the realms of Indriyas. He has wonderful powers of enchantment with his Maya which can be overcome only by total surrender unto Him. He acts with great enthusiasm and He is mightier than the mightiest as He supports and sustains the Universe. Sri Adi Sankara says ‘Nishreyas Saarthibhih Vedanaar hatvaat Vedyah – He needs to be realised by those seeking total welfare’. Swami Chinmayananda interprets the word to mean “That which should be known – as the Ultimate Truth; having known which, everything else becomes automatically known”. “Vedaischa sarvair aham eva vedyo – I am the One who is to be known through all the Vedas” and the same from Kaivalya Upanishad (22) which says ‘Vedair Anekair-Ahameva Vedyah’. 166. Vaidyah – The knower of all Vidyas or branches of knowledge. HE is the One who right from the beginning of the world knew all the vidyas that went into the creation of this Universe and hence HE is Vaidya. It is not only that He is the knower, but no one else is the knower of creating all the wondrous and manifold objects in His creation. 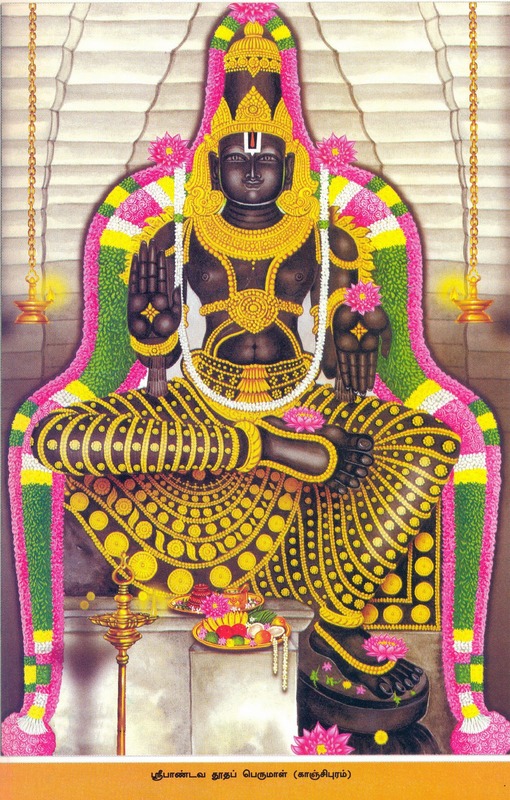 In the Yajur 7.43 it says “ViSvAni deva vayunAni vidvAn. He is the sarva-vidyA-maya Vaidya. In the Taittiriya AraNyaka 10.21 it says “Isvarah sarva-vidyAnAm”, the knowledge that we see displayed even in the insects, birds, etc., should be a constant reminder of the Vaidya or All-knower that is Bhagavan, and should lead us to the constant awareness that it is His feet that we should worship. ‘Eeshaanas Sarva Vidyaanaam Eeshvaras Sarvabhootaanaam – Verily He is the target of all learning and the Lord of all creatures’. Sri Adi Sankara explains this as ‘Sarva Vidyaanaam Veditritvaat Vaidyah – He is the target of knowledge for all branches of learning’. In other words no branch of knowledge is worth anything unless it shows a pointer to Him. The traditional meaning of the word ‘Vaidyah’ is a doctor or a man who cures diseases. Swami ChinmayAnanda points out that He is Vaidyah since He alone can be the doctor to the world that is suffering from ego and ego-centric misconceptions. Meaning: One might have accumulated sins the size of the Meru mountain; however if one worships Keshava the sins disappear just as even the worst diseases disappear when treated by a good doctor”. 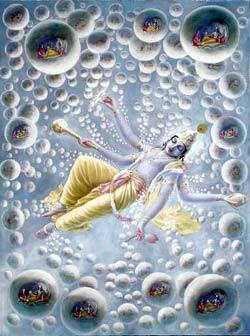 He knows the Vidya of releasing His devotees from the cycle of rebirth, and so He is Vaidyah. One who is always awake with respect to His devotees. One who unites with this Universe as the SarvaVyaapee. One who always follows the Dharmic way. One who treats everyone equally. Bhagavan is easily attainable through, and so He is SadaaYogI. Sri Adi Sankara takes the first meaning by saying ‘Sadaa aavirbhoota swaroopatvaat SadaaYogi meaning that HE is always present and available to his devotees’. Sri Parasara Bhattar interprets this Nama to mean that HE is awake at all times for His devotees, and He is awake as the antaryami or the inner soul in all of us. Shri Satyadevo Vaasishtha gives three different interpretations for this Nama –Satah AyogI, Sadaa yogI and Sadaa AayogI. Satas means equally, and Ayuj means to unite or to join. The root forms from which this Nama can be derived are many – yugi varjane – to give up; yuj samaadhau – to concentrate the mind; yuj yoge – to unite; yuj samyamane – to join. He is SadaaYogi because He has given up everything and always acts in accordance with Dharma. He is also a Sadaa-yogI because He unites this world into one through His pervasive omnipresence. His sarva-vyApti, His pervasiveness extends into everything that exists – Sadaiva yojayati samya mayati vishvaan lokaan sa Saaa-yogi. He is also a Sada-Yogi because He is constantly in yogic meditation, which is His nature. Yoga here can be interpreted as Samatva-bhaava. Sadaa yogah asya asti iti tam sadaa-yoginam, sadaa yoga shilam svabhaava-dharmaanaam vaa. The Vyakhyana in Dharma Chakram points out that people live in one of three ways of life – as a rogi, bhogi, or a yogi. Of these, the life of a yogi (who spends his life by diverting his senses away from sense-enjoyment and towards the parama-purusha) is the one that leads to peace of mind and health. The yogic state of mind is naturally attained by one who devotes his mind to the worship of the Lord, the SadaaYogi. 168. Veerahaa – The slayer of strong men of wicked nature. 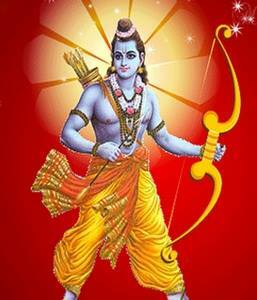 ‘Dharma traanaaya Veeraan Asuraan hanti iti – He destroys the warriors who rise against Dharma’. Meaning: In order to protect the righteous and to annihilate the miscreants, as well as to re-establish Dhama, I incarnate myself millenium after millenium’. Sri Parasara Bhattar interprets this to mean that he slays the Veeras who are “Kutarka-Sura-s” or those who put up false arguments to prevent people from meditating on Him. He refers us to the Shlokas in the Bhagavad Gita in Chapter 16 starting from 8th shloka and ending with the 19th shloka. Bhagavan gives a description of the kinds of behaviors that these pseudo-intellectuals demonstrate – claiming that God does not exist, or claiming that they are the God, etc. 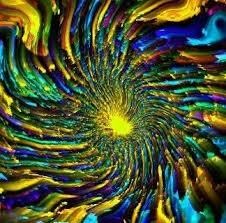 and hence such beings get caught in the cycle of rebirth and attain lower forms of life. We have already seen this as Nama 73 in Part 17 of our blog. Here’s a short summary of various meanings as a recap. A silent observer, a Maunee. 170. Madhuh – One who is like honey to His devotees. 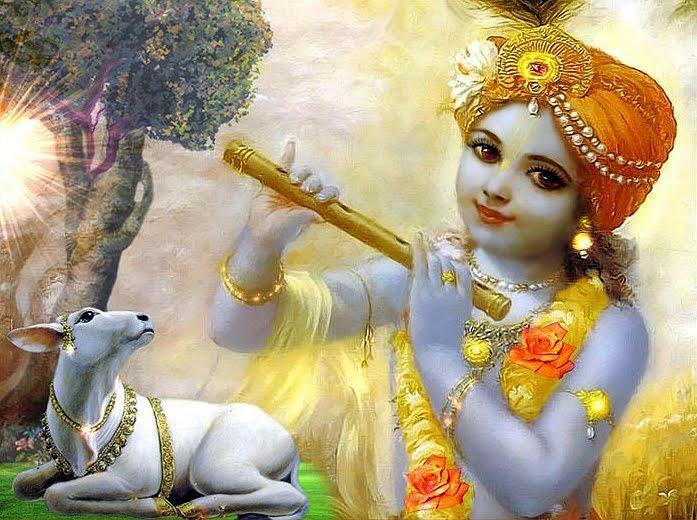 He is Madhuh because He creates Nectarine Bliss in the hearts of His devotees. ‘Yathaa Madhu Paraam Preetim Utpaa dayati Ayam Api tathaa iti – Just like the honey (Madhu) gives pleasure, Bhagavan also generates pleasure in the heart of his devotees.’ Honey gives physical pleasure, which is short lived and limited in time and scope. But Bhagavan gives unlimited and everlasting pleasure and that pleasure is that of the mind and not that of the body. Brihadaranyaka Upanishad says ‘Ayamaatmaa Sarveshaam bhootaanaam Madhuh (2.5.14) – He is verily the honey for all living beings’. We also have “thEnil iniya pirAne” as He is referenced by PeriyAzhvAr in his PoocchUttal. In the Dharma Chakram it says that madhu or honey is unique among all the edibles that when consumed is fully digested into the system with no waste products. He also points out that ‘Madhu’ is unique in that there is no ill-effect that results from its consumption, unlike some of the other edibles where an excessive consumption will lead to harmful effects. In this context, Bhagavan is the knowledge that is Madhu, from which only good can result. 171. Ateendriyah – One who is beyond the range of the sense organs. He is beyond the reach of our senses. As Adi Sankara puts it ‘Shabdaadi rahi tatvaat indriyaanaam avishayah iti Ateendriyah – He cannot be reached by any of our senses like sound, sight, touch etc’. ‘Ashabdbam asparsham aroopam avyayam tathaarasam nityam agandhavat cha – He is beyond the reach of sound, touch, sight, taste and smell’. Only those objects that have a fixed shape, color, or other characteristics will be recognizable by the indriya-s or sense organs. He is beyond these sense-organs, and cannot be realized through these or through sheer reasoning. The only way to realize Him is to experience Him through pure devotion and total surrender. The two mantras of ISAvAsya upanishad (anejadekam.., and tadejati tannaijati..) remind us of this quality of BhagavAn in simple words. Swami ChinmayAnanda points out that it is not just that He is beyond the reach of the sense-organs, but the sense-organs do not exist without Him, and so cannot sense anything without His power. So HE is the very subject of the sense-organs, and not the object of the sense-organs (the eye cannot see itself, but only its reflection in a mirror!). HE is also not seen by the Indriyas because He is not anywhere outside where the senses can sense Him, but HE is inside each of us in the size of a thumb or angusTha mAtrena! Sri Parasara Bhattar points out that this Nama signifies that He conceals Himself from those who are not devoted to Him through His power of enchantment. This is natural for one who is not within the reach of the senses-organs as we saw in the previous Nama. The Maya referred to here is that Bhagavan conceals Himself from those who do not seek Him. Other references to the sruti-s are – ‘ati-mohakarI mAyA mama’ (Sarabha 24), Vidyaat Mayinam tu Maheshvaram (SvetASvatAra 4.10). Maya is the mental veil, which prevents us from realising Bhagavan and makes us to carry on living as if the world and life are permanent for us. Adi Sankara says ‘Mayavi naamapi Maya kaaritvaat MahaMayah – Even the greatest people cannot see through His Maya.’ Even wise men are no exception and only through surrender can they navigate the tempestuous oceans of Maya or illusory impressions superimposed upon the mind! 173. Mahotsaahah – One of great enthusiasm. SrI Parasara Bhattar says that this Nama particularly indicates that, unlike the Eeshvara of the Sankhya system, who is possessed of knowledge but is a non-doer of acts and is indifferent, Shri Maha Vishnu is enthusiastic in performing all his acts which signify His lordship, such as the varieties of His creation, their sustenance etc. Bhagavan has Mahotasaaha GuNa as an Aishvarya with no dependence on anything else for support. Because of this, HE is unceasingly creating, maintaining and withdrawing His creations, and managing the affairs of the Universe. Swami ChinmayAnanda points out that this world will not exist without the endless enthusiasm of His Mighty Power. Just as the ocean, with its endless waves is the “sleepless agitator”, so also BhagavAn is the Enthusiastic Accomplisher. Shri Satyadevo Vaasishtha gives a different interpretation to this Nama. He looks at this word as mahaan + ut+ saahah – mahaantam uccais tamam saahah, sahate, saahyati, sahati vaa sa mahotsaahah – One who has immense ability to endure. Here saahah has the same meaning as sahah – sahati. He has the quality of great endurance as noted in the Yajurveda mantra ‘saho’si saho mayi dehi (yajur 19/9)’ – Let the great Endurer give me the power of Endurance’. Another reference is from the Rig Veda – Naakshas tapyate bhuri bhaarah – (1.164.13) to support this interpretation. He supports the Sun, the Moon, Stars etc., tirelessly, and He is also the self in every being that has been created, and it is His MahotsAha that is manifested in His act. Of the three qualities of the rajas, tamas, and satva bhavas, actions done with enthusiasm for the benefit of mankind are those that are equated with the Satvic disposition. Sri Adi Sankara’s VyAkhyAna is “balinAmapi balavatvAt mahAbalah – He is called Mahaabalah because he is mightier than the mightiest’. In fact He is the source of strength for everyone. As Gita (7.11) says ‘Balam balavataam chaaham – I am the Strength of the Strong’. Sri Radhakrishna Sastri gives several examples of this Guna of Bhagavan. Ravana went to the Patala Loka to win over Mahabali. Bhagavan who had established Himself as the gatekeeper of Mahabali, temporarily made Himself invisible. 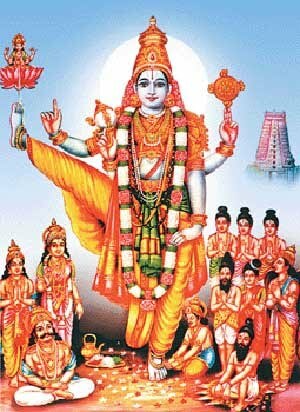 Ravana tried to move the kundalam of Hiranyakashipu which was lying at the doorstep as it has fallen from Hiranyakashipu’s ears at the time of his being slain by Lord Narasimha. Ravana’s hands got caught under the kundalam. Bhagavan appeared on the scene, and kicked Ravana without effort and Ravana went flying far away. Krishna, as a final effort to avert the war, goes as an emissary of the Pandavas to meet Duryodhana and Dhiritarashtra. Satyaki was keeping a watch on Duryodhana hidden from view. He heard it all and hastily went back to the assembly and apprised Krishna of the plot. Krishna merely laughed and said ‘let them try’. 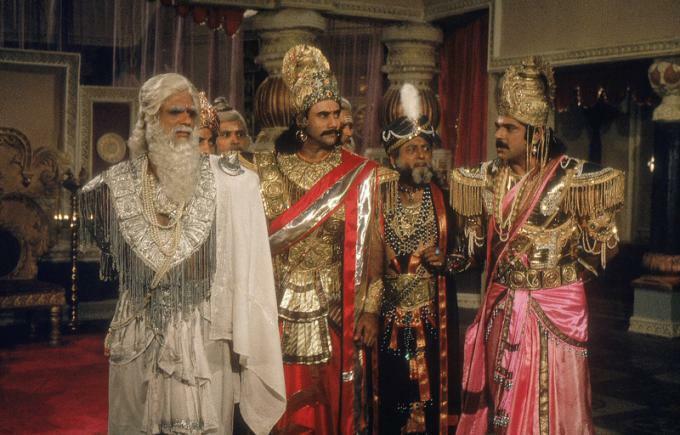 While thus engaged, Duryodhana entered with his followers and ministers. He gave orders to his guards to go and arrest Krishna. The assembly gasped. Satyaki got up and drew out his sword. Krishna sat calmly and touched Satyaki’s sword bearing arm asking him to lower it. 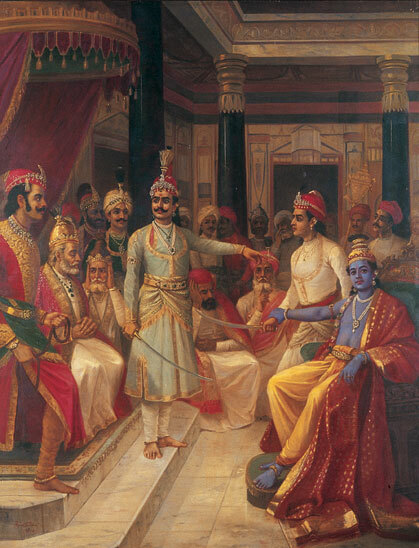 Duryodhana repeated his order to seize Krishna. But just then a great miracle happened. Krishna’s body suddenly flashed like lightning and He began to grow in size. 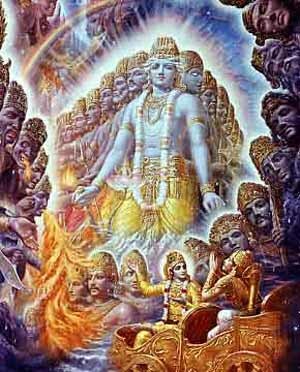 Krishna’s mace, discus and club weapons appeared, blazing brilliantly. His pores emanated light, sparks and clouds of smoke. The sight was too frightening. Everyone in the assembly were dazzled by the brilliance and closed their eyes. Only Bhishma, Drona, Vidura and Sanjaya were able to look upon Krishna as He manifested His Universal form. The rishis also gazed upon Him, folding their palms and offering prayers. The sky resounded with celestial drums and flowers showered from the heavens into the hall. 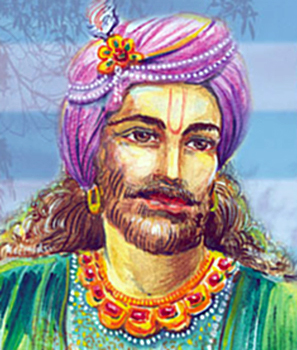 Sanjaya described the wonderful and yet terrifying sight to Dhritarashtra. Krishna said “So be it” and Dhritarashtra was thus able to see for the first time and he saw the huge Universal form of Krishna. He also saw numerous gods approaching Krishna and worshipping Him with Vedic mantras. He was pleased and he sat down. His blindness returned. Krishna slowly reverted back to his usual form. He then walked out of the assembly knowing that nothing could be done now as Duryodhana was blinded by Maya. Thus Bhagavan once again demonstrated that he is MahaBalah. ShrI Satyadevo Vaasishtha explains this Nama from the root word bal – praanane – meaning to live or to breathe, and gives the interpretation that Bhagavan is Mahaabalah because He makes the world live and supports the world. 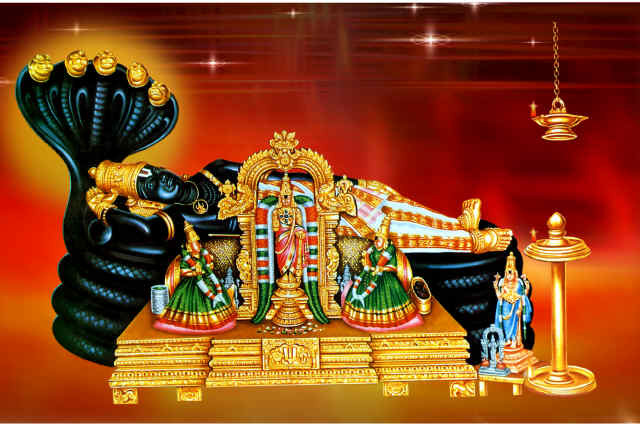 He points out that there are different kinds of balam, e.g., vidyaa balam (the strength of knowledge), sena balam (the strength of the army), dhana balam (the strength of wealth), anna balam (the strength of food) etc., and Bhagavan is the One who is the bestower of all the balams (means of support) to the devotees, and so He is Mahabalah’. Bhagavan is the One who is to be realised and He is easily attained through Bhakti, so He is Vedyah. 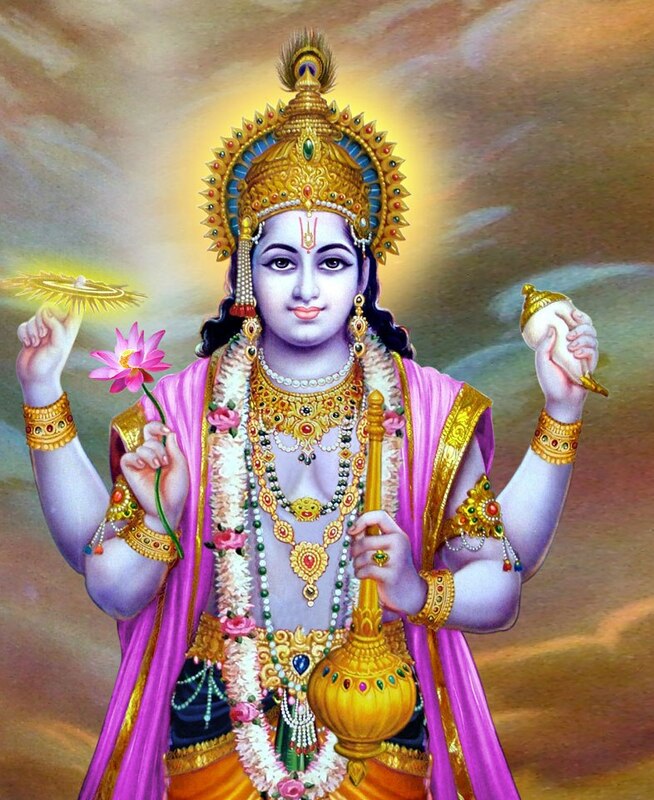 HE is the all Knower and possesses complete knowledge of all branches as HE created the Universe, hence He is Vaidyah. He is forever in meditation and forever available to his devotees, so He is SadaaYogi. He is the slayer of the wicked and hence Veerahaa. 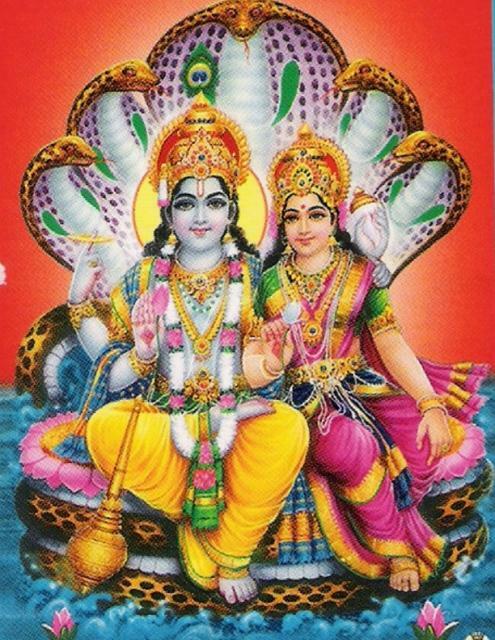 He os propounder of knowledge of the Supreme Being and consort of MahaLakshmi, so He is Maadhavah. He is like nectar to his devotees, so He is Madhuh. Bhagavan cannot be comprehended or sensed by the sense organs as he is beyond the realms of Indriyas, so He is Ateendriyah. HE has wonderful powers of enchantment with his Maya which can be overcome only by total surrender unto Him, hence He is MahaMayah. He is Mahotsaaho as He acts with great enthusiasm and He MahaBalah as He is mightier than the mightiest. Terrific as usual. To be honest I don’t read through the whole thing. I steal some of your awesome pics & like to comment that I am a bigger fan of your audio visual post as it is easier for me to follow as a working woman. Praises for your selfless narration Mr.Sridhar & Mr.Shri Balaji. Happy Diwali to both of you & your families. Hari Om! Thank you Darini 🙂 Happy Deepavali to you and family! Hari Om Mr.Sridhar & Mr.Shri Balaji! Yet another beautiful commentary. Your story line is adding a lot of interest to your narration. I have not come across the story of Hirankashipu’s Kundalam, that is very interesting. 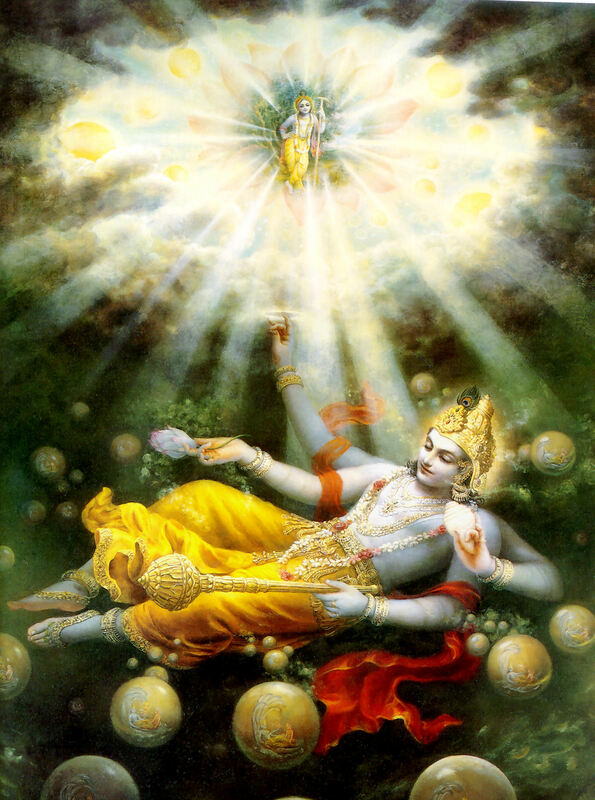 I have read the story of Lord Krishna in the Krishna Avatharam. Overall its blissful to read from your blog. Happy Diwali to you & your loved ones my Son. Hari Om! Amen! Thank you Sir! Hari Om! Amen!